Editor’s Note: is a contributor to Practical eCommerce and manager of search engine optimization and social media marketing with VizionInteractive, a Dallas-based online marketing firm. Hartzer wrote the article, below, which first appeared in that company’s blog. This search engine optimization tip has to do with removing a page or a specific URL from the Google search engine. I’m not going to go into a great deal of explanation about why you would want to remove a page from Google. There are many reasons for doing that (which might include the fact that it’s a duplicate page or maybe even a page that has sensitive data on it that you don’t want given out to the whole entire world). But, what I am going to do is give you several options for removing a web page from Google. After I name each option, I’ll give you some more details about it. First, you must verify your website in Google Webmaster Tools, to show Google that you’re really the website owner. To do this, you need a Google account. Then, log into Google Webmaster Tools and “add your site.” Then, you’ll need to click on the “verify your site” link. You’ll be asked to either add a file to your website or add a meta tag to your site. This is normal, Google will need proof that you own the website. Once you’ve added the meta tag or added the file, you can verify the site. 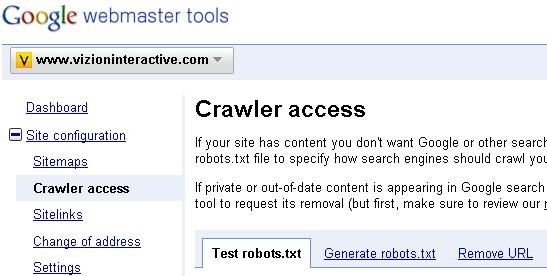 Google Webmaster Tools "Crawler access." Google Webmaster Tools "New removal request." Google Webmaster Tools "Removal options." Individual URLs: Web pages, images, or other files. 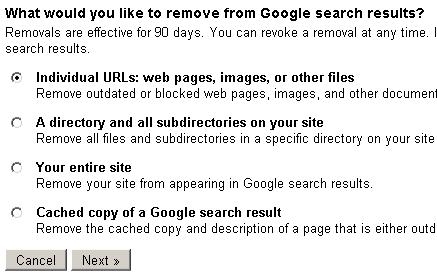 Remove outdated or blocked web pages, images, and other documents from appearing in Google search results. A directory and all subdirectories on your site. Remove all files and subdirectories in a specific directory on your site from appearing in Google search results. Your entire site. Remove your site from appearing in Google search results. Cached copy of a Google search result. Remove the cached copy and description of a page that is either outdated or to which you’ve added a noarchive meta tag. What you choose here will depend on whether you want to remove a page, remove an entire section of the site (like directory), the entire site, or even the cached copy of a Google search result. If you want the page to disappear altogether, then you’ll first need to remove or delete the page from the web server. Then, use the Google removal tool as I just described above. You’ll need access to your website, of course, to do this. This can be either FTP access to your website or maybe even access to the content management system that you’re using. If you put a user ID and password (require one in order to view the web page) on the web page, then Google’s crawlers will not be able to use that log into the page to crawl it. Google, and other search engines, when they see the noindex tag on a page, generally won’t index the page. It’s preferred that you put the noindex tag in the header area of the code on the page, but you might try adding it to another part of the page…that should work, too. Every site should have a robots.txt file. Make sure that you “disallow” crawling/indexing. If there are links pointing to a web page, then most likely it will remain in the search engine index. If you have pages on your website that are linking to the page you want to remove, get rid of those links. You can easily go to Yahoo! and search for: link:http://www.vizioninteractive.com/page.html, where page.html is the page that you want to find the links pointing to it. There may be other pages on other websites linking to that page, so you’ll want to get those links removed, as well. You may need to ask those other webmasters to stop linking to your page.